Corporate systems are becoming progressively more complex and interconnected with one another and with the platforms they use. In current applications there is a great diversity of layers through which information passes or is treated, from the user interface to the storage base for necessary data, and vice versa. In each of these interfaces (defined as being the frontier between two layers), there is a need for specific tests, both for the integration of processes in each layer individually, and unitary tests. Time-to-market deadlines are also becoming progressively tighter due to competitiveness and competition on the market in which the organization operates. Delivery of applications is increasingly complex in increasingly shorter times, with greater demands for quality. This is the main challenge of the areas involved in the lifecycle of systems. The different types and levels of tests as stages in the lifecycle of systems are not immune to these needs and the fact that these stages occur at the end of the development and maintenance cycle, when deadlines are running out, makes them even more critical. 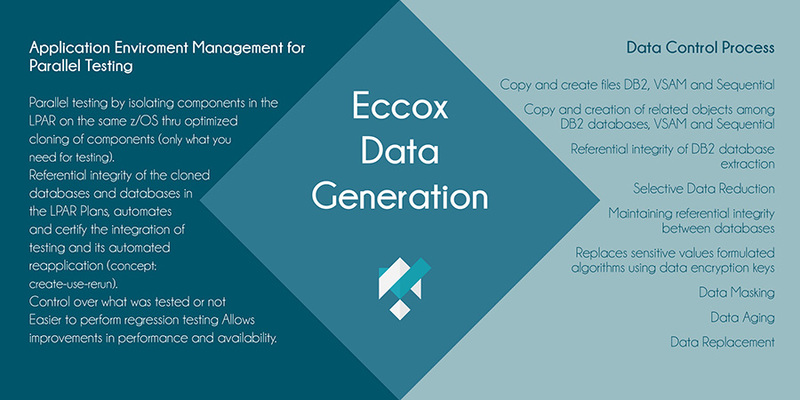 Eccox Application Environment Management significantly reduces the time required to conduct tests by reducing the idleness of the teams involved and allowing the concurrent execution of tests even in cases of conflicting use of resources. By reducing the deadlines for tests without necessarily reducing the effort to conduct tests, pressure regarding time-to-market is reduced, enabling a better assessment of deliverable quality. By facilitating the re-execution of tests at any time, the effort required to conduct tests, correct falilures and enable submission for new tests is reduced to the necessary minimum volume, allowing the staff involved to concentrate on really productive functions instead of returning to the process of preparing tests for yet another preparation.